You know what I realised the other day? John Goodman is a cinematic treasure. Okay, so my thought process maaaay have been influenced by the fact that Mr Goodman has earned himself his very own star on the Hollywood Walk of Fame. It may have been further cemented in my brain after the wonderful Jeff Bridges chose to honour his Big Lebowski co-star by resurrecting The Dude himself, reciting Donny’s eulogy from arguably the best film ever made. Just look at John’s face. He’s loving this as much as us. But, whatever. The fact remains that John Goodman has a presence in our lives that is hard to beat. One quick look on his IMDb page illustrates just how much he has contributed to television and film over the past 30 years. In fact, I think you would be hard pressed to find someone who isn’t able to name at least one of John Goodman’s many performances. Whether it is as the voice of Sulley from Monsters Inc. (2001), the terrifying Plinkett-a-like of Howard Stambler in 10 Cloverfield Lane (2016), or the cruel and odious Ocious P. Potter from The Borrowers (1997), there’s simply no excuse for being unaware of his work – regardless of your generation. 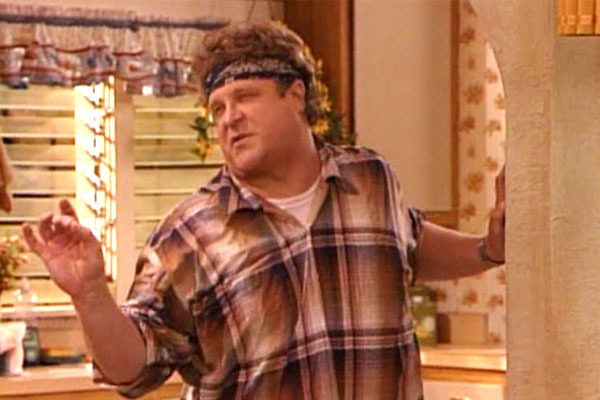 For many people, myself included, I still think of John Goodman as Dan, the loving, easygoing husband in the 1988-97 television series Roseanne. Something about his everyman persona, a man who earns his money to enjoy life with his wife and children, stood the test of time and formed the emotional anchor to a series that simply wouldn’t exist if it were made today. The amount of awards that were pushed his way during his tenure on Roseanne proved he was more than well received in this role, and the mental image I have of him seems to permanently feature him in a red and black checkered shirt, mug of coffee or can of beer in his hand. It’s sad to think that the final few years on the show were so difficult, but it would seem that the lure of Hollywood was hard to resist for a popular actor. Despite the fact that John Goodman has appeared on our screens every year, in one way or another, for 34 years, I’m always happy to see him step into frame. The less I know about what I’m watching, the greater the surprise. 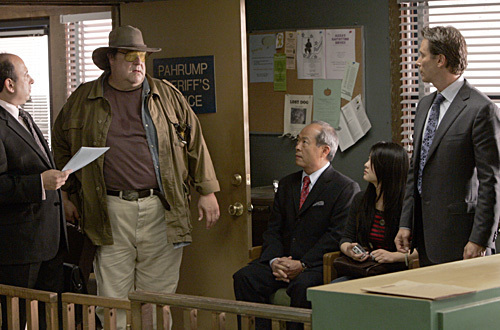 Of all the times this has happened, I can’t think of a greater surprise than his portrayal of Judge Robert Bebe in the two-parter special of 2007’s thoroughly under appreciated Studio 60 On The Sunset Strip. In this episode, a cast member of the eponymous television series has been arrested in Nevada due to an unfortunate mix of an unpaid speeding ticket and a bag of marijuana left in a borrowed jacket. Desperate to smooth things over, the studio heavies descend on the small town of Pahrump, Nevada, to try and recover their lost cast member, who must be seen by a Judge in order to be released. Disgruntled at being dragged in from a fishing trip, the Judge finally arrives and he isn’t best pleased. He eventually drags the entire party out to a local diner and begins to try and understand the events that have led to this situation. He is at once affable, razor sharp and frustratingly lax with his timekeeping. As an actor, he is a charismatic and scene-stealing presence. As a character actor, he is impeccable. There is no denying that he makes this episode worth watching, a trait he brings to virtually everything he stars in. This is just one of a hundred other examples. 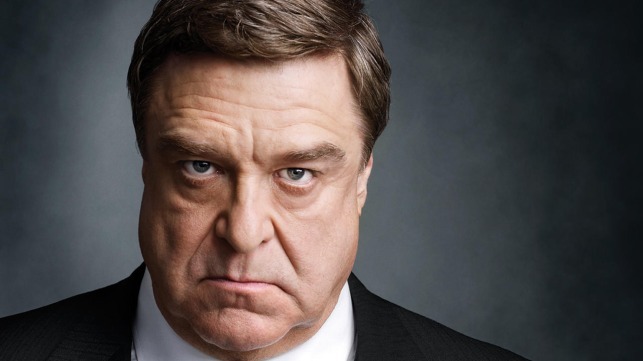 John Goodman is a solid actor that is capable of bringing a unique energy to the screen. He is able to steal a scene, yet remain an outstanding supporting character. The Big Lebowski (1998) is perhaps the quintessential example of this, though Inside Llewyn Davis (2013) and Trumbo (2015) are both excellent examples of his recent work. And yet, deep down, I will always still see him as Dan. I hate to typecast, but he will always be the fun, wise, dedicated paternal glue that holds a family together. Everything else, well, everything else is just the icing on the cake. I love you dad-I mean, John Goodman. Long may you remain on our screens!